How does Water Jet Liposuction work? Water-jet or body-jet liposuction is a product of recent liposuction advances. 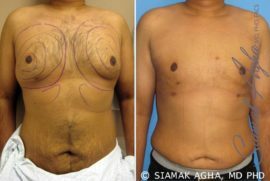 In 2007, a group of German Plastic surgeons launched this new technique of removing fat tissues via water jet spray as an alternative to the current methods available. From 2007 to present, several modifications have been made to the original procedure, developing it into one of the most promising liposuction techniques available. It was not long after the procedure gained steam that it started to earn the respect of U.S. surgeons. Today, water jet liposuction is performed in several surgical clinics around the United States as well as other parts of the world. Water jet liposuction was developed to avoid the risks associated with other liposuction techniques. In most liposuction procedures, tumescent liquid is injected to the treatment area. Tumescent liquid is used to break up the fatty cells, to numb the treatment area, and to decrease blood loss. However, tumescent fluid use has also been widely linked to the most common drawbacks of liposuction including tissue swelling, inaccuracy of fat removal, toxicity, and fluid overload. During water jet liposuction, very little tumescent liquid is used because high water pressure is used widely to break up the fatty cells and tissues. Without the need for much fluid, the danger of damaging the surrounding tissues and cells in the treatment area is minimized. Water jet liposuction procedures have the added benefit of shorter surgery time compared to conventional liposuction procedures. Cellulites are the known triggers for unwanted bulges and bumps. They are found directly under the skin tissues, accumulating all the excess fats that your body acquires. In simple terms, cellulites are stubborn pockets of fat that expands as you gain weight, giving you disproportioned shape. When liposuction was introduced, it gave men and women alike the much needed hope for them to enjoy the body shape they always wanted. Then again, some would often complain that although fat tissues are sucked out of their body, their cellulite continues to be a problem. In conventional liposuction, only fatty tissues are removed, leaving cellulites untouched and ready to acquire more fat in the future. Since the skin becomes loose and saggy after a liposuction procedure, it gives cellulites an even bigger arena to expand. The problem with cellulites is said to be resolved with water jet liposuction. Some experts claim that the procedure can ease the cellulites along with the fat tissues. The high-pressure water jet is able to break apart cellulites, making them accessible to the suction device. In water jet liposuction, the fatty deposits including cellulites are broken up and turned into a gelatinous state. When that happens, the suction cannula is inserted under the skin’s surface to suction out the gelatinous deposits without harming the other tissues surrounding them. Effective against Cellulites – One common complaint that is often heard from patients who have previously undergone liposuction is the expansion of cellulites. The stubborn fat pockets take advantage of the fact that fatty cells are sucked out of the body through liposuction; they expand more freely. That is not a problem with water jet liposuction because it can suction out the cellulites along with the fats. Water jet liposuction can ease the cellulites along with the fat deposits that lie under the skin. That’s what cosmetic experts see as the best advantage of this highly innovative technique. Grafting – There’s one unique advantage that water jet liposuction pose. That is the possibility of grafting the extracted fatty cells elsewhere in the body that needs enhancement. The fatty cells extracted during the procedure do not need lengthy processing and are ready for immediate transfer to augment any body part. Speedy Recovery – Another remarkable feature of water jet liposuction is the fact that patients do not have to wait for weeks to get back to their normal routines. Water jet liposuction is not as taxing as conventional liposuction. It will only take a few hours for the process to be completed. For the most part, patients also do not need to undergo general anesthesia. Patients testify that the recovery period for water jet liposuction is far easier than with other techniques. It can be painful right after the operation but not as painful as going through other procedures. What is even more amazing is that the pain causes minimal discomforts just the day following the procedure. Reduced Risks – Unlike conventional methods, water jet liposuction only takes a few hours and requires minimal sedation. Water jet liposuction has reduced risks as compared to other liposuction procedures. The risks of bruising, swelling, bleeding, and saggy skin are less likely. Also, water jet liposuction shuns the use of heat unlike laser-assisted liposuction or radiofrequency liposuction preventing risk of burns. In any case, being safe under water jet liposuction also depends on the patient herself/himself. To reduce your risks for possible complications and side effects, you must take all the precautionary measures needed. First, choose your surgeon well. His expertise and knowledge will spell the difference on the outcome of your operation. Second, follow all your doctor’s instructions closely regarding preoperative and postoperative care. A standard requirement for anyone who will go through water jet liposuction as any other surgery is health clearance. You must ensure that you are safe to undergo the operation. To learn more visit water jet liposuction. Are you interested to find out if you qualify for water jet liposuction? Call to schedule your complimentary consultation with Board Certified plastic surgeon, Dr. Agha, at his Plastic Surgery Body Contouring Center in Newport Beach (949) 644-2442. Practicing in Newport Beach, Dr. Agha has been granted staff privileges at several local hospitals and outpatient surgery centers. In the interest of the safety of his patients, he only performs surgery in fully accredited facilities with the proper services and staff.